Maybe you’re not up to date on your Portuguese history. (Then again, maybe you are.) 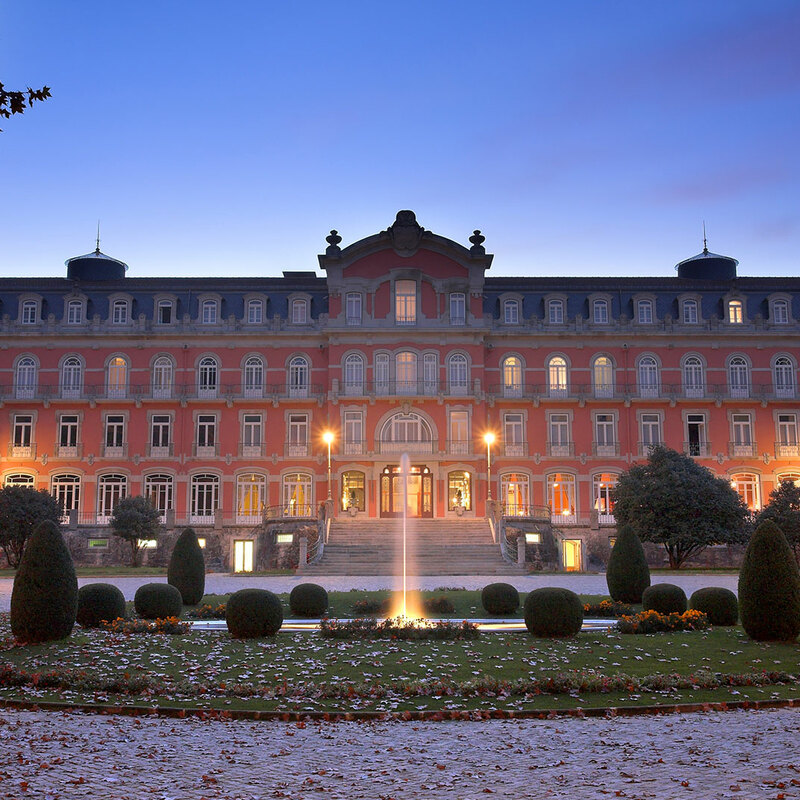 Anyway the striking Belle Époque facade tells you a thing or two: despite the Vidago Palace’s relatively remote location near the country’s northern border, the hotel has a grand past based on its strategic position. Built in 1910, it’s near the Chaves hot springs, famous since Roman times for their healing properties — and a longtime favorite of Portuguese kings. More than a century later, the hotel is just as glamorous as the day it opened. 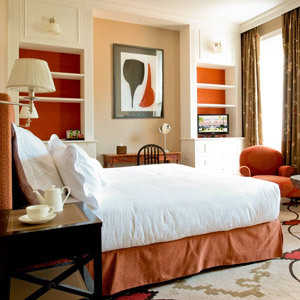 But the opulent interiors have been smartly adapted to suit modern tastes; the magnificent ballroom now houses the stylish Salão Nobre Dining Room, the region’s healing waters flow through the sleek marble spa, and the guest rooms and suites are smartly outfitted with floor-to-ceiling windows and quaint roll-top bathtubs. 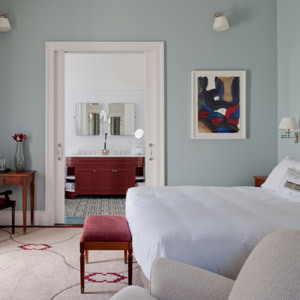 Upstairs, the look is less traditionally Portuguese than dapper English countryside with a retro twist — buttoned-up, but with a sense of humor. 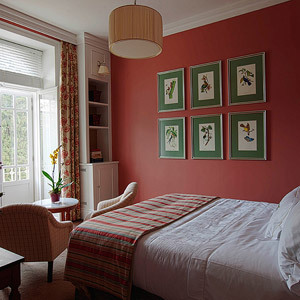 Even the most standard rooms come with private wisteria-framed terraces, views of the park, and civilized seating areas with fancifully upholstered bergères chairs. 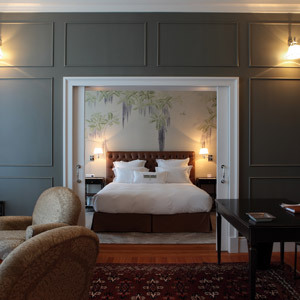 Suites have separate living rooms, antique furnishings, leather sofas, and, perhaps most notably, exquisitely hand-painted de Gournay wallpaper. Downstairs, the Vidago Palace aesthetic is distinctly aristocratic: rich drapery, gleaming marble staircases, stately columns, silk wallpaper, Venetian chandeliers, floors lined with colorful mosaics. As you’d expect, there are more venues for strolling, dining, and sipping well-prepared cocktails than you could possibly fit into a single visit, unless you’re staying for a week. There’s a great golf course and a fitness center, a well-stocked library, breakfast in the wrought-iron conservatory known as the Winter Garden, and Douro Valley wine tastings in the Cellar, gourmet salads by the spacious outdoor pool, and drinks in the ultra-modern Clubhouse. The highlight is, of course, the sparkling thermal spa offering treatments based around Vidago’s famous waters — if they were good enough for King Charles I, they’re probably good enough for you.